The UpStage team offers online or on-site workshops to introduce groups and individuals to the concept of cyberformance, how to use UpStage, creating graphics for UpStage and devising performances using UpStage. Workshops are customised according to each group’s needs. “There is no better arena or forum for students to learn the beginning steps of virtual theatre than Upstage.” Nancy Reilly-McVittie, senior lecturer, Manchester Metropolitan University. if you are interested in reading more about UpStage, click here for links to relevant articles, theses, etc. Workshop participants at the 2006 Eclectic Tech Carnival in Timisoara, Romania, learn how to use UpStage. Photo: Urska Merc. A basic introductory workshop can be as short as two hours; a longer workshop of 15-20 hours will include devising and presenting a short cyberformance. Technical requirements for workshops are an internet-connected computer and headphones for each participant, and a data projector and screen for the workshop tutor’s computer. UpStage uses specific ports which may need to be opened if the internet is being accessed through a firewall – this must be tested beforehand. to be sure to know when one is coming up. 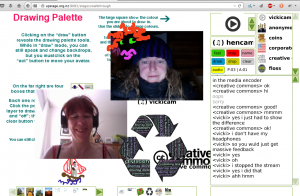 We can also teach workshops remotely, and have done so for groups in the UK, USA and Europe. Remotely-taught workshops have ranged from two-hour introductory sessions to a full day or a number of shorter sessions over several days.